The X-Files: Earth Children Are Weird is available now from Quirk Books. Excerpted from The X-Files: Earth Children Are Weird based on characters by Chris Carter and illustrated by Kim Smith. Reprinted with permission from Quirk Books. The truth is out there (in the backyard)! 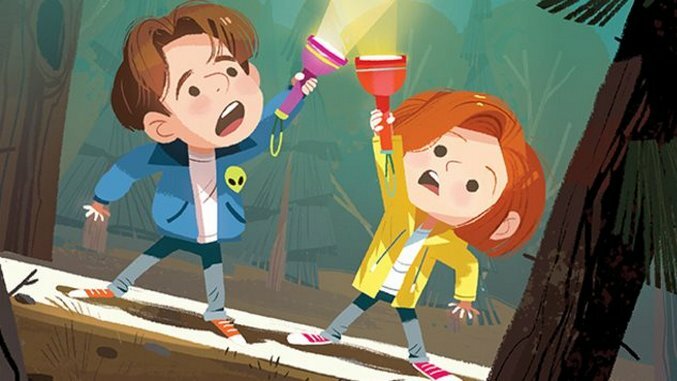 A new picture book stars kid versions of The X-Files’ Dana Scully and Fox Mulder, and it’s adorable. Titled The X-Files: Earth Children Are Weird, the book is based on Chris Carter’s characters and boasts charming illustrations by Kim Smith. What begins as a backyard camping trip turns into an adventure, as lil’ Dana and Fox search for alien life. Although it’s written for kids, both young and old fans of The X-Files will adore Earth Children Are Weird. Check out the gallery to view some of Smith’s art from the book, and watch the animated book trailer below for some child-friendly chills.